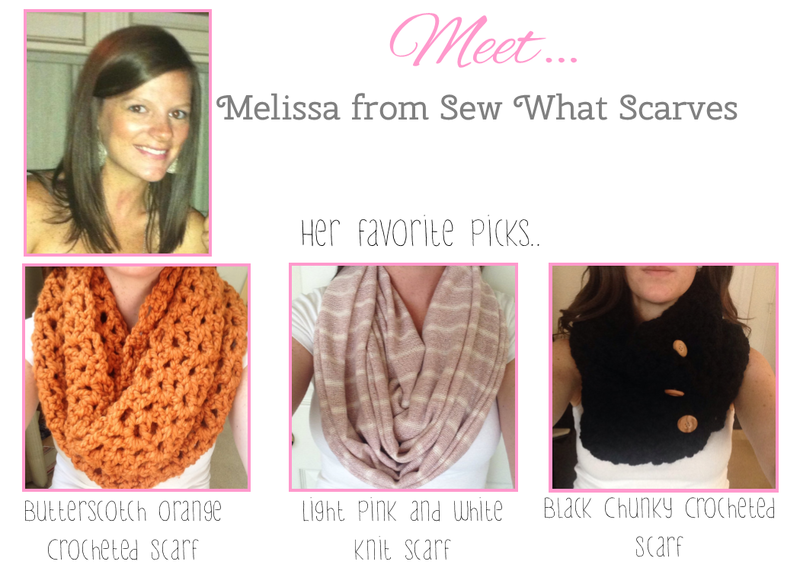 Today I am happy to welcome to the blog Melissa from Sew What Scarves! She has the cutest scarves listed in her etsy shop and I thought you should all know a little more about her! Here's a little more about Melissa! I'm currently accepting personal requests and custom orders for crocheted scarves and am always willing to take on a big project! For example, I had a lady in New Jersey contact me about making 30 scarves for her Pink Magnolias Breast Cancer Awareness event in October. I was able to find fabric for her and deliver the scarves in time to be used for a commercial shoot! I've also done custom orders for bridal party gifts and custom crocheted orders as well. Be sure to stalk her even more to find out more projects she's been working on along with new items in her shop!